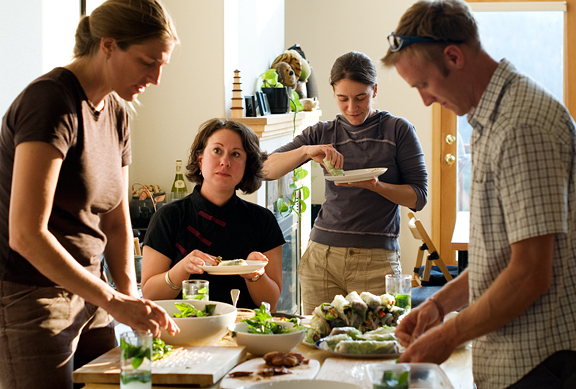 There is no better way to kick off a new month than with a dinner party. I mean, a dinner partay. I was running a little behind schedule when folks began to trickle in yesterday evening. Luke and Nichole asked if there was anything they could help with. Normally (and my friends will verify) I say no and have people sit down with drinks, appetizers, and let the conversation roll. I’m a bit of a control freak like that. But the appetizers were not assembled yet, Jeremy was tending grill and dishes, and I was still getting my mise en place EN PLACE for dinner. I sliced up the grilled pork chops and showed Luke how to wrap spring rolls while Nichole became the mojito maestra. They took to their tasks like pros. The food was in good hands and I could relinquish those duties without a worry. Nice. I guess you *can* teach an OCD to delegate. It’s times like these when I am reminded why I should only serve Chinese food if the headcount is under 6… because we don’t have burners with enough BTUs to handle the volume. But it’s a known fact that you can’t get decent Chinese food in Boulder. Period. I wanted to treat our buds to something authentic, you know? It would have been great to whip up a quick meal so I could sit down and chill with folks more. I tried a newish recipe this week that was fast and amazing. We both loved it. Unfortunately, at $30/pound (okay, technically $27.99/pound – but when you buy 4 pounds, that $8 becomes negligible) it’s not an especially economical dinner to be serving at a dinner party. I dare say it’s worth the splurge for a lovely dinner for two. I wanted to recreate a meal I truly enjoyed at the Alley House in Pagosa Springs, Colorado – a pan-seared crusted ahi tuna. When I got to the Whole Foods Seafood counter, they were out of ahi tuna so I opted for the maguro (tuna sashimi) which looked particularly fresh and brilliant next to the yellowfin tuna steaks. Not to mention that Jeremy and I are sashimi and sushi whores. It’s so quick to throw together and cook that you’ll have no excuse not to walk the dog. I mixed black and white sesame seeds with salt and pepper and coated each steak with the mixture. The seeds do a remarkably good job of sticking to the fish (I was expecting a lot of sesame seed confetti everywhere but ON the fish). My dad has done this before with crushed wasabi peas, those munchy little snacks you can find in Asian markets. I didn’t have any on hand, but that sounds fantastic. Something to try later. A quick drizzle of wasabi mayonnaise and anago sauce (or serve them on the side for dipping) and you’re done! I topped ours with a little masago (smelt fish roe). It’s basically a sushi roll without the rice or seaweed. No wonder we love it! 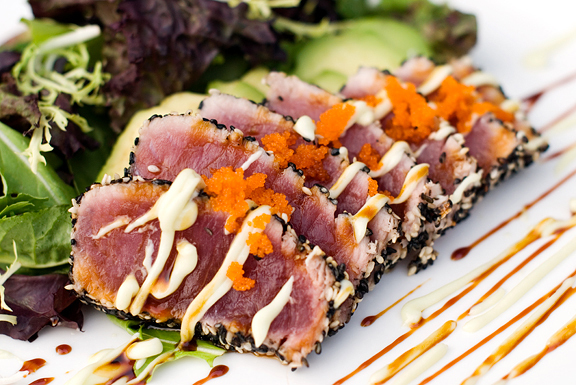 Tender tuna, crunchy sesame seeds and masago, creamy avocado, sinus-clearing wasabi mayonnaise (actually, it’s quite mellow by my standards), and a sweet accent from the anago sauce make for a mouth-watering combination. It’s so easy too! 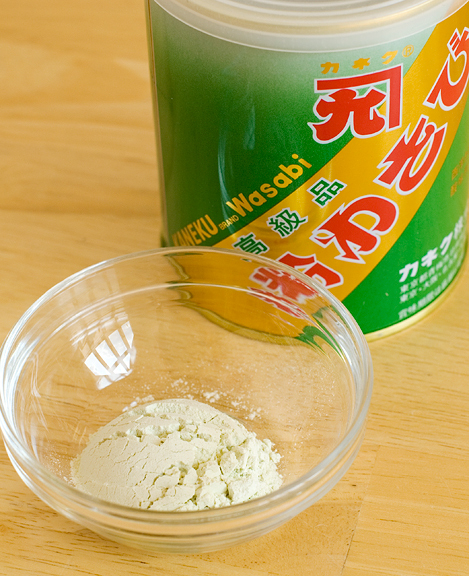 Wasabi mayonnaise: Mix the wasabi powder with the water until it forms a uniform paste. 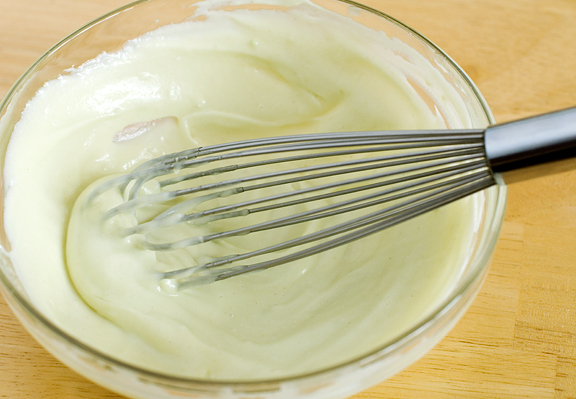 Mix with the mayonnaise. It tastes better if you let it sit in the refrigerator for an hour or so before serving. Anago sauce: Combine ingredients in a small saucepan and bring to boil. Let boil for a minute or so and reduce to simmer until slightly thickened. Let cool (it will thicken some more, so don’t boil it down too much). 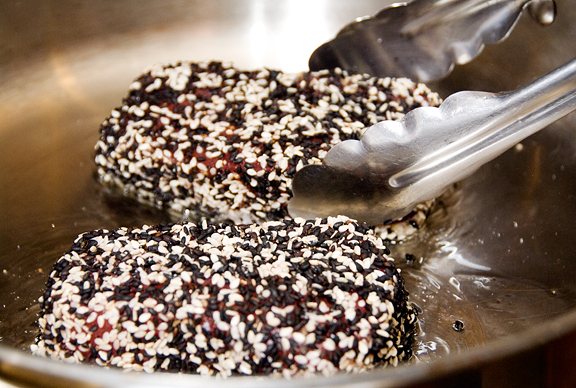 Combine the sesame seeds, salt, and pepper in a bowl. 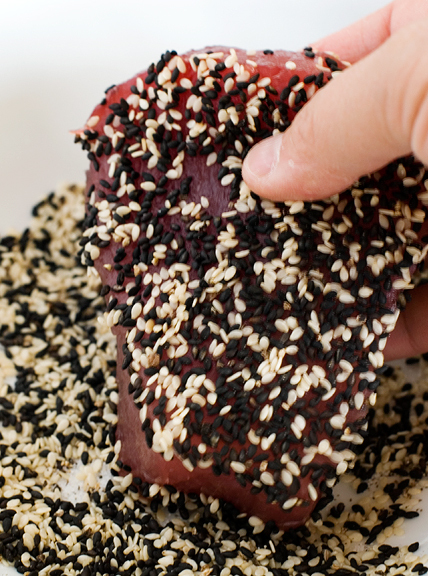 Completely coat the tuna steaks in the mixture, pressing seeds and seasonings into the flesh. Heat the oil in a large, shallow frying pan over high heat. When the oil is hot (chuck a sesame seed in and it should sizzle – just take care if the darn thing jumps and hits you!) set one or two steaks into the pan. Take care not to crowd the steaks. More than two at a time will make it hard to sear the sides without overcooking the other pieces. Sear for less than a minute on the flat sides (unless you want it more cooked) and while gently holding the steaks with tongs, sear for about 20 seconds (or more if you prefer) on the short sides. Remove to a cutting board and slice the steaks into 1/2-inch thick pieces at an angle – or leave whole if you prefer. 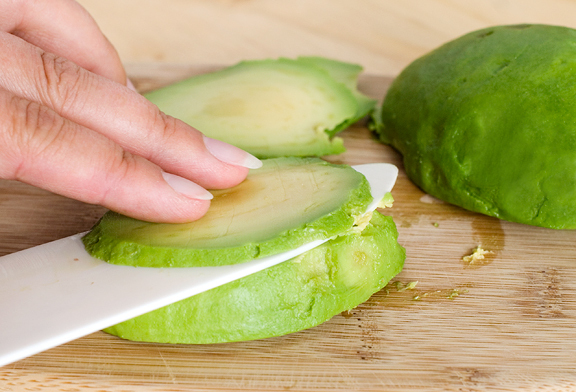 Set avocado slices on a bed of salad green and then fan the tuna on top. Drizzle with wasabi mayonnaise and anago sauce over the fish or serve on the side. Top with a sprinkle of masago. Serves 4. Stunning photos and I can tell by looking at your recipe it is killer. Thank you.. I plan on making this very soon for my husband, he’ll love it! You have some very lucky guests, there, Jen! Do not let my husband see this incredibly beautiful post. He will give me a look like, “why don’t YOU make something like this?” I WANT TO, that is for sure! Only two of ’ems making, the other two’s eating. I don’t blame them! Great pics and great recipe. I reckon a dinner party (for two, methinks) is in the cards. oh everything looks so delicious. i hope that one day, i may be able to throw as fabulous dinner parties as you do. So lovely. I’m just never sure whether the tuna I see at my local grocery stores is good enough to be eaten rare. How do you tell whether something is sashimi quality? Does it have to be never-frozen tuna or would thawed tuna also work in this recipe? Thank you! Ooh, that looks amazing! I’ve only cooked tuna at home once, and it was before I ate sushi, so I had trouble getting past the whole rare fish idea. The mentality has since changed, and we are, in fact, going out for sushi tonight. But I can’t wait to try the combination of flavors you’ve described here. Beautiful final shot! I love using white and black sesame seeds. They add such a pop of contrasting color and are tasty to boot! I’m so glad you posted this. Seared tuna is one of my favorites but I’ve been too chicken to try it at home. Bookmarking this for a go at it in the near future. Thanks for sharing! That dish looks so beautiful and mouthwatering! this is one of my favorite foods…why didn’t I ever think of the wasabi mayo? thanks for the idea! Looks amazing! I love the presentation- tuna is such a beautiful food. Near and dear to my heart. Thanks for the great post! And also- I am just like you for most dinner parties. Usually shooing people out of my kitchen wanting them to relax with a beverage and something to snack on. Sometimes, ya just gotta give in I guess! the colors in the last pic are so vibrant! This is one of those, “To die for recipes”…I’m SURE! Mmmmm! This looks so tasty! yum! pan seared tuna is one of my favs!! yours looks DELISH! Stunning, absolutely stunning photograph! I love pan seared tuna but never get it quite right …. I definitely need to try this dish, it sounds amazing, Jen! I’m so afraid to pan sear tuna. I think I need to come over for a lesson. That looks amazing. this is awesome! And truly a splurge! But a splurge is good once in a while!! fantastic meal there Jen! I can relate to the $30/lb. for the ahi! Used it this summer when I made Mark Miller’s Spicy Pacific Tartares. but it was so worth it, especially to share with good friends. If you like spicy sauces, you should definitely try the two that went with that recipe. Your seared Ahi looks unbelievably delicious. Oh my – that looks delicious! I’m with you on eating the fish semi-rare. There’s just nothing like the smooth velvety-ness of properly cooked (and by that I mean scarcely cooked) tuna steaks. Yes, tuna is quite a pricey treat around here too… but so worth it! Your steaks are cooked to perfection, wonderful! Yummy! I just bought whole tuna and will carve out the loins and make this tonight. Made it for supper… Easy-peasy, maximus delicious. What a treat! Thank Yu. And…am I the only one who wants to hear what the menu was for the par-tay? When, when can we share a meal!? Those look delish–I love Spring Rolls, and the tuna looks amazing! Just made these today with some sashimi quality ahi. Fast and very delicisious. I especially love the added flavor the wasabi mayo and the anago sauce give it. Thank you! You just reminded me of how much we loved sesame crusted tuna. time to get those yummy steaks in. Eesh – it should say if it is sashimi quality. 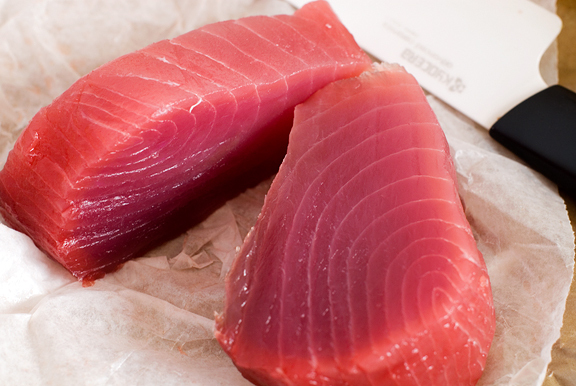 Sashimi should have been frozen beforehand to a pretty low temperature to help kill any parasites or eggs in the flesh. Only purchase from a reputable fish monger, is my best advice. Lisa – the menu was: viet spring rolls (with grilled marinated pork strips), mojitos, steamed rice, stir-fried beef with stir-fried spinach, chinese fish-flavored pork, stir-fried sherry chicken w/ vegs, blackberry peach crisp, green tea matcha macarons with passionfruit buttercream, lemon custard ice cream. OMG! I am so making this! This has become a staple. Simple and elegant. My husband and I just love the writing the friendship and your recipe! Just made this, it’s great, and easy! 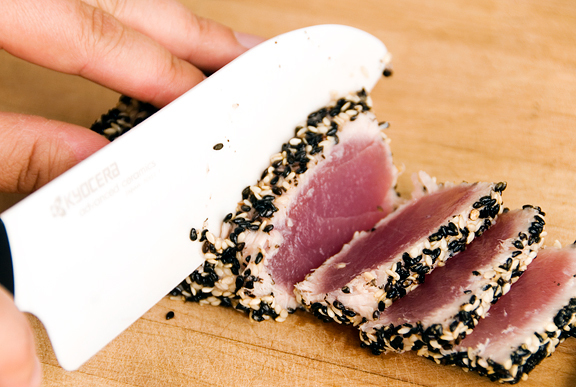 I am always looking for new ways to do tuna steaks, and the sesame seed coating is a winner. Super-easy, and gives it the perfect crunch. I did the wasabi mayo and the kids enjoyed the unago sauce. We made this not one night, but two consecutive nights. It was amazing. I found the wasabi mayo to be a little thick for drizzling, so the second night I made a siracha mayo which was also tasty! Glad I found your blog! I made this for my wife and I and it was excellent! Our favorite restaraunt was flooded in September and we always had it there. Restaraunt is still closed so I had to do something! Great recipe and it is a very quick dish. I love tuna. I get seared tuna everywhere they have it on the menu. I have to say there is NO recipe out there that trumps this one. This has become a staple in my kitchen, friends and neighbors invite themselves over when I’m making it. Not only is it better then most seared tuna dishes I’ve had, it blows any out of the water. Not only do I make it regularly I have been inspired to actually buy a professional sashimi knife. Now the tuna is sliced thin like the sushi houses. And I feel like a badass with my freaking awesome Dagasi knife, it is worthy of this dish. Thanks for the recipe. You have made boatloads of people happy. Great, simple recipe. I’m lucky enough to be able to catch tuna (southern bluefin) so we’ll definitely be trying your dish on board the next fishing trip. Nice to see another Kyocera Ceramic Knife user! I have one as well and use it exclusively for sashimi and sushi. Thank you so much for showing me how easy it is to make a beautiful, delicious and healthy dish that I’ve always enjoyed at restaurants. Wife was impressed. Great blog…keep up the good work! I’m a bit of a novice cook and Im just now starting to enter the “seafood” world. I was wondering, where do you get your sesame seeds from, the black ones at least because I cant find them. Also mirin? Can that be found in regular grocery stores like Walmart or Sweetbay? I want to plan a romantic dinner for my boyfriend this weekend and tuna is his favorite. I know he is getting tired of the typical chicken meals I make for him all the time lol. Thank you! I made this last night… DELISH!! The only thing I had trouble with was my anago sauce. For some reason, it just wouldnt get thick. I think it might be because of my non-stick pans because I cant even reduce balsamic vinegar at my house using my own things, i have to use someone else pans. Even though my photos didnt turn out good because of the “runniness” of the sauce, it was still delicious and very easy to make. Thanks! Lovelle – hello dear and my apologies for not getting back to your first comment earlier! 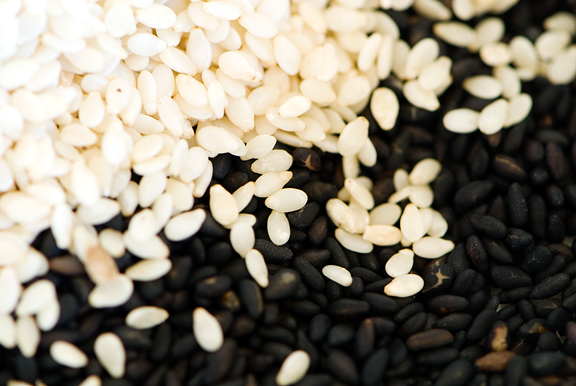 the sesame seeds are easily found in Asian grocery stores and probably places like Whole Foods. It’s hit or miss with other places, me thinks. Same for mirin. While you’re at the Asian grocer (if you have one nearby) look for the anago or unagi (I think the one I use now has unagi written on it) sauce. Makes life much easier :) And good job on forging through! !